REVIEW: CINDERELLA IS ALL THINGS MAGICAL! What Sukanya Verma loves about Kenneth Branagh’s extravagant vision is he gives us a Cinderella that’s got a little more spirit and penchant for horse-riding if not the hand-drawn delicacy or singing prowess of her animated avatar. Most fairy tales conclude on such a delightful note, it’s easy to ignore the drudgery that paves the path of dream-come-trues. Even at its most simplistic they signify something truly profound -- magic doesn’t simply fall in your lap, you have to earn it. There’s an everlasting charm (and serious box office potential) to this theory and umpteen successful adaptations, on paper and celluloid, attest it amply. It’s among the first fairy tales I read alongside the Russian Kolobok and Hans Christian Andersen’s The Little Match Girl. If Kolobok had me pining for sweet bun, The Little Match Girl inspired premature melancholia but Cinderella made me want to swirl in a sparkly frock, slip in a pair of glittery shoes and look at pumpkins as a little more than a source of fibre and vitamins. Except, as opposed to books, which allow you the liberty to become her and paint her with your own personality, movies are always about the bippity boppity boo, also one of the greatest gimmicks in fiction. 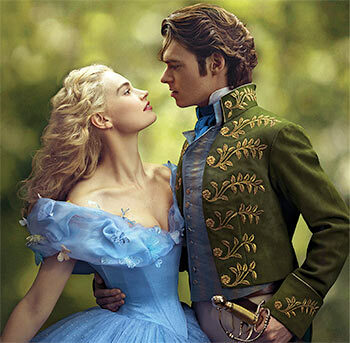 What I love about Kenneth Branagh’s extravagant vision is he gives us a Cinderella that’s got a little more spirit and penchant for horse-riding if not the hand-drawn delicacy or singing prowess of her animated avatar. A willowy Lily James (Rose from Downton Abbey) plays the heroine of many a young girl’s dreams with an enthusiasm that dazzles the screen, but is mindful of not stretching it too far. She’s trained for compassion by a mother whose last words of wisdom -- on courage and kindness -- she holds on to like a blessing, one she chants regularly, zealously. He doesn’t miss a single detail. Like when Cinderella learns her father (a warm Ben Chaplin) wants to remarry, her face first turns pale but she quickly composes herself and welcomes the decision. She sees the world not as it is, but as it could be, we’re explained right at the onset. It’s the sort of sunny optimism that sits well with the genre. But there’s cynicism and cunning too – in the form of Cate Blanchett’s icy Lady Tremaine. Mean was never this majestic. Why such a sophisticated lady, even if revolting in her thoughts, would raise her two daughters to be such witless dolts (Holliday Grainger, Sophie McShera) is something I’ve often wondered. Her creations exude bold flamboyance for Lady Tremaine, kitschy candy hues for her girls, might and magnificence for Helena Bonham Carter’s Fairy Godmother and, above all, a joyous celebration of a girl’s grandest dreams and romance in the iridescent blues of Cinderella’s spellbinding 12-layer gossamer gown that goes best with a pair of gleaming glass slippers. Powell tailors more than a dress, she creates a person. Visually, too, the feel-good confection transports the viewer into a land of scenic countryside, baroque ballrooms, elegant mansions featuring swan-shaped chandeliers, vibrant bedrooms with flowery-patterned wallpapers, dimly-lit attics and plump, pouting rose gardens sprouting from the superlative imagination of Dante Ferretti. The latter is where Prince Charming (Game of Thrones’ Richard Madden lives up to the title) has a moment alone with our titular beauty. “Glass slipper?” he asks with a tinge of disbelief. “And why not?” she counter questions, as if momentarily possessed by her director and theatre veteran Branagh responding to all the criticism hurled at him for taking on lesser (read big-budget Hollywood) films? Cinderella is certainly destined for business. But because it’s in able hands, it doesn’t ruin your association with the classic by merely recycling what you already know. What it does is remind you of that forgotten virtue called grace and the timeless thrill of watching a garden pumpkin turn into a golden chariot.